3 Things I Wish I'd Known Before My "For Sale by Owner"
When you’re selling, the last thing you want is for your home to sit on the market for months, particularly if you’re a military family with a strict PCS deadline. Without selling that home on a deadline, you may wind up stuck in a year-long lease at your next duty station because you couldn’t access the capital you needed in time to buy. You can only stay in temporary PCS lodging for so long! To get your house sold quickly, let’s look at 3 things you’ll wish you’d have known before your For Sale by Owner home sale. Keep this mantra and “show me, don’t tell me” in mind when you’re preparing your marketing for your FSBO. As someone who used to get paid to write the MLS listings for luxury homes, I hate to say that the pen isn’t as powerful as the lens, but in this case, relating the proximity to a running trail simply doesn’t have the same effect as the photo of a mom pushing a stroller on a serene trail. The photo conveys so much more that the words cannot; you legally can’t say that the home is in a safe location, but momma and her stroller on a jaunt in the woods don’t convey any present danger. Likewise, the overused phrases “gourmet kitchen” and “a chef’s dream” mean nothing next to the photo of your fabulously spacious kitchen bedecked in all its Sub-Zero and Wolf appliance glory. Hello, beautiful! Hire a professional real estate photographer to help craft your selling pieces. You can find tips on how to do this in our interview with military spouse real estate photographer Trish Alegre-Smith. While we don’t recommend ignoring the fact that any home sale presents a potential for a lawsuit, there’s no need to delay the sales process simply to conduct lengthy research on the legalities of a home sale. 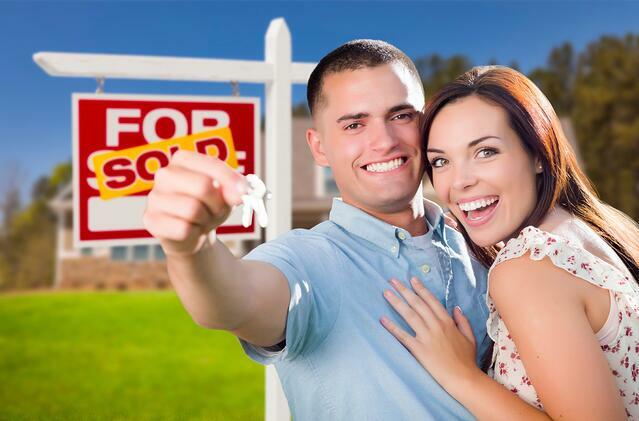 MilitaryByOwner Staff Writer Monica Schaefer has successfully conducted multiple home sales. She says that she completed the Offer to Purchase form for one of her FSBO home sales on a cocktail napkin! While you could go the cocktail napkin route, you can also find inexpensive state specific legal forms from US Legal Forms. To help make sure that all of your legal ducks are in a row, hire a real estate attorney or an escrow agent company to manage the transaction of the title and funds. Make sure to download MilitaryByOwner's FREE e-book, For Sale by Owner: Is It an Option for You? that will help walk you through the entire process of conducting a successful FSBO. In the last chapter, you’ll learn not only what to expect when you get to the closing table, but also how to get there! Unfortunately, we can’t press the easy button (or the “enter” button in this case) on the appraisal process by simply googling our address to find its value. While online algorithms known as Automated Valuation Models (AVM) can help provide an estimate of our home’s value, they have a self-reported margin of error of 20 percent! If you price your home at $200,000 because your online search suggested that was your home’s current value but your actual home value is only $160,000, you may find that your house sits on the market for well beyond the busy PCS moving season. The major problem with AVM’s is that they only take raw data into consideration. They lack up-to-date market information and are over reliant on square footage in their valuations. They also don’t consider the updates and investment you have made in your property. You can read more about AVM’s in our article How Do I Estimate My Home’s Value. Spend just a few hundred dollars to have an appraiser evaluate your home; as a bonus, you’ll know whether your home will qualify for FHA and VA loans before you accept any buyer’s offer! Have you completed a FSBO? What do you wish you’d known?